Drools Fiddle is the fiddle for Drools. Like many other fiddle tools, Drools Fiddle allows both technical and business users to play around with Drools and aims at making Drools accessible to everyone. The entry point to Drools Fiddle is the DRL editor (top left panel), which allows to define and implement both fact models and business rules, using the Drools Rule Language. Once the rules are defined, they can be compiled into a KieBase by clicking on the Build button. All the actions that are performed on the working memory will be represented by arrows in this graph. The purpose of the User icon is to identify all the actions performed directly by the user. 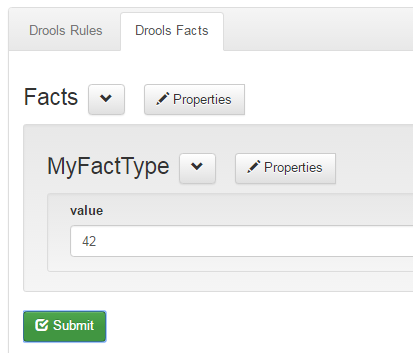 This form allows you to create instances of the fact types that have been previously declared in the DRL. For each instances inserted in the working memory a blue node will be displayed in the Visualization tab. The arrow coming from the User icon shows that this action was performed manually by the user. Once your working memory is ready, you can trigger the fireAllRules method by clicking on the Fire button. 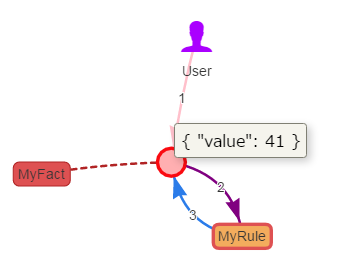 As a result, all the events occurring in the engine: rule matching, fact insertion/update/deletion are displayed in the visualization tab. 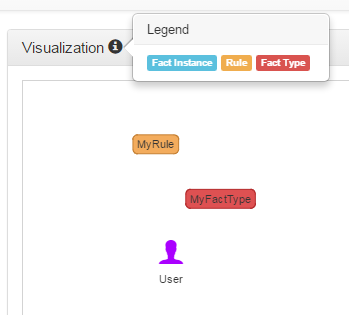 In the above example, we can see that the fact inserted by the user in step 1 triggered the rule "MyRule" which in turn modified the value of the fact from 42 to 41. Step by step debugging of the engine events. We would love to have the feedback of the Drools community in order to improve the fiddle and make it evolve in the right direction.